2moms2dogs2babies: Family Holiday in the Sun! We just returned from beautiful Tu.rks & Cai.cos where we stayed at the Bea.ches resort. This was our first real holiday as a family. The weather was gorgeous - sunny and warm (27 Celsius/high 70s Fahrenheit). This resort offers a very easy and worry-free vacation spot for families with young children. Sesame Street can be found everywhere, including nightly shows and Camp Sesame (daycare) for children of all ages. 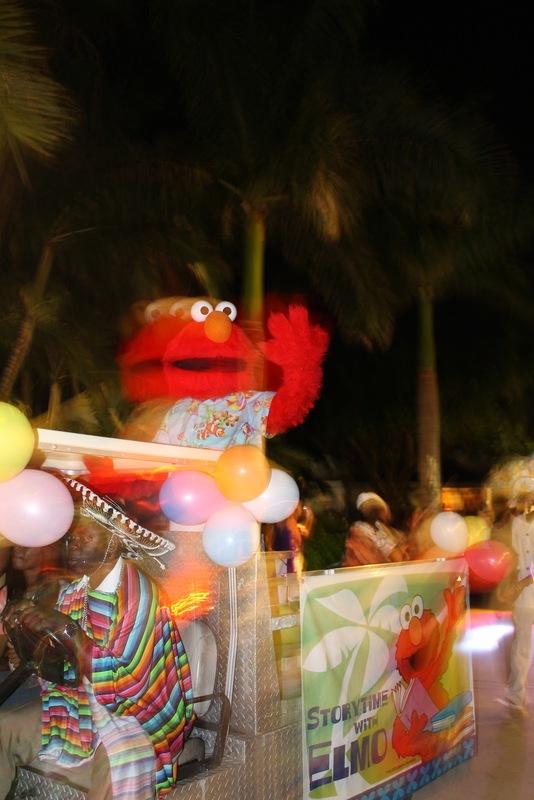 The characters will often be seen walking around the resort waving at wide-eyed, awe-struck children. The girls loved the Sesame Street shows, which were followed by a kids dance party. Our little dancing queens had a blast dancing on stage with the other kids. Three meals per day in restaurants was challenging at times, but overall, I think that the girls did very well. While there was some food throwing and even one broken plate, they enjoyed the sights and the constant attention from the friendly staff. I had to let go of their usual diet and I'm glad I did, because holidays are a time to enjoy. I will admit to momentary panic when we picked up blue-mouthed girls from camp one day. Their snack...Fruit Loops! We rented a wagon (see pictures below) for the week to cart the girls around. Fortunately, the novelty of the wagon lasted throughout the week. Riding in the stroller wouldn't have had the same appeal. The resort also has its own water park with slides and a lazy river. 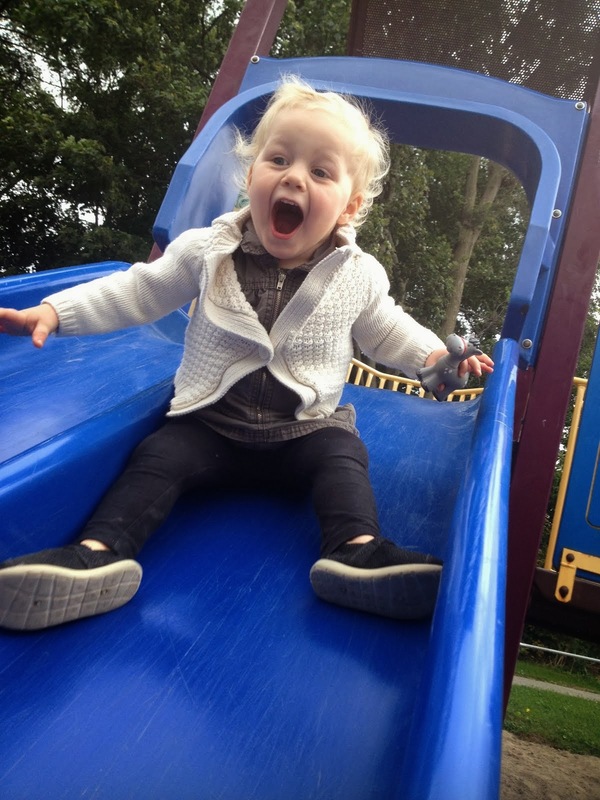 They even have slides for the younger ones. While Jenn and Teagan enjoyed the lazy river, Quinn quickly got the hang of the slides. Unfortunately, I don't have pictures of this one because she required a lot of supervision. We did enjoy ourselves but Jenn and I found the week to be tiring. It was pretty crazy with two 20-month olds who never stop moving and listen less than half the time. This meant that one of us couldn't take the girls to the beach or pool (giving the other a break). We didn't use the camp as much as we probably should have. I'll take the blame for that one though! I had a hard time leaving them when they were crying and frantically reaching for me. Since the girls don't go to daycare and are only babysat by people they know, all three of us weren't used to it. I know that I need to grow some thicker skin! A few pictures from the trip! shallow areas, perfect for small toddlers. Big kisses waiting for the parade! The star of the Sesame Street parade! The resort had a fantastic shaded playground. Pretty girl (plus T's arm) before dinner. She hated getting out of the pool. Some quick beach time on our last day. These pics are fabulous! Makes me want to go some place sunny and warm. Next year with baby in tow, hopefully! PS - I owe you an email and I am embarrassingly late on replying! But I AM going to, promise! It's a great resort. I highly recommend it. They definitely do everything right in the kid department! The warm weather really brought their curls out! We actually gave Quinn's little rat tail (haha) a trim this morning for the first time! Glad to hear you guys had such great weather and that the resort did such a good job of catering to the littles. Hope you're not too tired from your vacation! These pictures are adorable! I especially love the ones of the girls in their little wet suits, super cute. Thanks! The little suits were a good find, plus they had UV protection. this looks so awesome!! I had no idea Beaches was kid friendly! !